The multiplication math games within the Zapzapmath ecosystem are abundant in natural richness, from beautiful forests, to luscious produce, to gems and jewels that glitter with the hope of wonder and vast knowledge that you learn everyday. By now, you would have come across many of these blessings that the ecosystem provides us with. Today, a team of gemologists is on the hunt for rare ambers. Amber is fossilized tree resin, and it is commonly appreciated not just for its natural clarity and beauty, but also for commonly containing fossils of ancient bugs. Typically yellow in color, amber is believed to have healing powers. Since you have never seen amber in person, much less searched for one, you have decided to join the group on this hunting mission. It is always good to learn about new things. Plus, you really want to find a piece that you can make into a keepsake for your mum; it would make such a thoughtful gift! Amber deposits can be found in various beaches and riverbanks. The team has decided to head to the closest riverbank in search of these rare gems. Armed with a magnifier each, everyone splits up to cover more ground. Very soon, you find some amber deposits! To identify the clarity of the amber deposits and the fossils that they hold, you need to decipher if the multiplication given is true or false. Study the question carefully, and tap on True or False when you are ready. The right answer will bring you another gorgeous amber to work on, whereas the wrong answer will have you trying again. There is ample time, so do try again! Amber Collect X is one among our many games that practices common multiplication skills. Though multiplication is trained very often during your time in the Zapzapmath ecosystem via our multiplication math games, it is vital to consistently develop and understand the properties of multiplication. 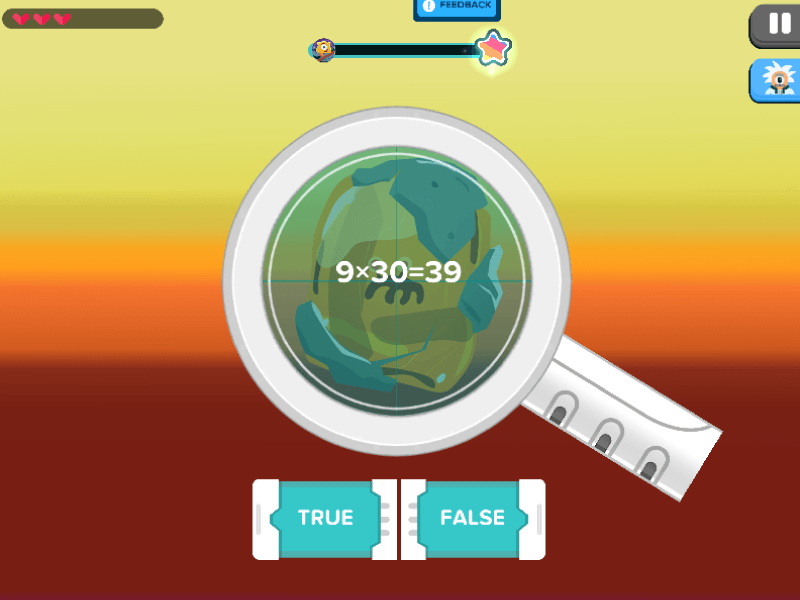 The simple gameplay of answering true or false to multiplication questions provides you with a new method and opportunity to reinforce your understanding of this mathematical concept with the rest of our multiplication math games. Like addition, subtraction, and division, multiplication plays a big part in your journey towards mastering mathematics because it is one of the major building blocks for other mathematical concepts. Once you are comfortable and confident in the use of multiplication by practicing with our multiplication math games, you will be able to apply all your training to calculating a myriad of equations in various summations. This training will evolve into comprehension of math sentences and concept formation in later stages of your math adventure.